A double dip of Cronenberg tonight. A History Of Violence was first. I hadn't bought it. I have mixed feelings about Cronenberg films. There are some that I just don't connect with and others I really like. I liked A History of Violence. It's a nice tight little story with great characters. If I'm going to watch a drama I want them to be this interesting. It's a studio film that's much more accessible than Cronenberg's normal output. Harry Knowles over at Ain't It Cool News said he thought it was Cronenberg's best film since 1986's The Fly. He has a good review on his page. I normally don't care for his reviews. It's a personal thing. I think AHOV is better than The Fly, and I certainly like it as much or more than my favorite Cronenberg film Naked Lunch. I'll buy a copy, it's only 15 bucks on Amazon, and it will probably be cheap at Target before the year is out. Viggo Mortensen plays a small town cafe owner, Maria Bello is his wife. They have two children, a small daughter and a high school age son, and a happy home life. Two really bad men try holding up his cafe. Viggo fights back and kills them both. The brief flash of publicity attracts the notice of Ed Harris. Ed's under the impression that Viggo is a guy from Ed's past. Ed thinks Viggo is the guy who ripped up the side of his face with a fist full of barbed wire, and he'd like to take that guy back to Philly. There are things to discuss with the family. Viggo insists that he isn't that guy, Ed is mistaken. Ed and his thugs circle Viggo and his family in their ominous black car. I hate to give anymore away. The violence ramps up and more people start dying. The situation pushes Viggo's family apart and it's a struggle to reunite them by the time the film's over. All this in 98 minutes. The cast is great, everyone doing a top notch job. The small parts as well as the large parts. Cronenberg is one of those filmmakers that attracts interesting people to his projects. It's the work, not the money. And they all work very hard to make this a good film. Here's an interview with Cronenberg. AHOV is based on a graphic novel. I never read the novel, have never looked in a copy, I did recognize the cover. I didn't like the look of the art from samples I saw on the internet. Cronenberg says the movie only uses a small part of the graphic novel and then goes it's separate way. 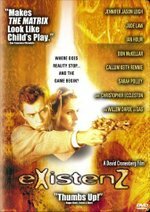 Existenz is like a nightmare. Reality breakdown from too much game playing. "Am I live, or am I Memorex?" I never cottoned to this movie when it originally came out. I don't have a copy, and it's cheap on line. My initial feeling, when it was originally over, was one of disappointment. After all the running around by Jude Law and Jennifer Jason Leigh, the message was videogames are bad. I just couldn't imagine why anyone would bother to even mention it. There are several scenes I like and the cast is good. The story just doesn't click with me.